List of Author(s): Unni LE, Chauhan OP. Copyright: © 2018 Unni LE. This is an open-access article distributed under the terms of the Creative Commons Attribution License, which permits unrestricted use, distribution, and reproduction in any medium, provided the original author and source are credited. The effect of high pressure treatment and conventional thermal processing on the various quality attributes of onion paste was studied. Thermal processing not only caused significant reduction (p<0.05) in enzyme activity and microbial count, but also resulted in the significant (p<0.05) degradation of phytochemicals and antioxidant activity. At lower pressures, polyphenol oxidase and peroxidase were found to increase significantly (p<0.05), but they decreased at higher pressures; whereas, total phenolics, flavonoids and antioxidant activities showed a slight increasing trend due to high pressure processing. The CIE L* values decreased while a* and b* values were found to increase significantly (p<0.05) with increase in the pressure. The microbial counts in terms of total plate count, yeast and mold count as well as total coliform counts were also reduced significantly (p<0.05) with increase in pressure. High pressure processed samples were rated better as compared to thermal processed one in terms of sensory attributes. Onion, Paste, High pressure processing, Thermal, Quality. There has been a significant change in the processing methodologies of foods in the last few decades. High pressure processing is a novel non-thermal method which offers high quality products with greater retention of phyto-nutrients, improved safety and at the same time with increased shelf-life . As high pressure processing does not affect the covalent bonds, the low molecular weight food components such as flavoring agents, pigments, vitamins, etc. are expected to undergo lesser changes during high pressure processing. Unlike thermal processing, HPP effects are uniform and nearly instantaneous throughout the food and thus independent of geometry and size of the material . The most successful high pressure processed commercial products are orange juice, avocado sauce and puree, ham, cooked rice and rice mixes, marinated chicken, meat, oysters, etc. being sold in USA, Japan and European markets. The European Commission has included the high pressure processed products in the group of ‘Novel Foods’ and under the aegis of Novel Foods Legislation. High pressure processing is useful in inactivation of several pathogenic and spoilage microorganisms in foods at refrigeration, ambient or moderate temperatures with fewer changes in texture, colour and flavor as compared to conventional thermal processing . Several reports exist with regards to five decimal reductions in pathogenic microorganisms including Salmonella, Staphylococcus, Vibrio, etc. . Several reports also exist with regards to effect of high pressures on antioxidants, sugars, vitamin C, carotenoids, phenolics, flavonoids, etc. in products from oranges, tomatoes, apples, peaches, mixed citrus juices, carrots, strawberries, raspberries, etc. and the benefits of high pressure processing as perceived by consumers has also been described in detail [6,7]. Onion forms an important part of most of the culinary preparations. Several reports exist with regards to the preservation of this condiment paste using thermal processing and by use of chemical additive. Rheological, colour changes and changes in antioxidant properties have also been studied in the condiment paste during thermal processing and storage . Literature also exists with regards to effect of high pressure processing on flavonol content and antioxidant activity of peeled onions . However, as such, there is no literature available on preservation of onion paste using high pressure processing technology. Therefore, the present work was undertaken to study the effect of high pressure processing on various phyto-chemicals, enzymatic activity, microbial and sensory characteristics of onion paste. Raw onion was obtained from local market of Mysore, India. The onions were manually peeled by removing outer few layers of scales and fleshy leaves and then pulverized in a high speed mixer (Preethi Heavy Duty mixer grinder, Model No. MG142, Bangalore, India) to yield fine paste. The paste was packed in low density polyethylene pouches (75 μ thickness, 50 gm pack size) and processed immediately. A laboratory scale high pressure food processing system (ISO-LAB FPG9400, Stansted Fluid Power Ltd., Stansted, UK) consisting of a high pressure vessel (2 L capacity) with dual high pressure pumps and pressure intensifiers which work simultaneously was used to achieve and maintain the desired pressure in the pressure vessel. The system had a maximum operating pressure of 1000 MPa with provisions for temperature and time variation. The high pressure vessel was surrounded by a liquid circulating jacket connected to a heating-cooling system. The pressure transmitting fluid used was 30% mono-propylene-glycol (supplied by M/S Hydraulicon Systems, Ahmedabad, India). The ramp rates for pressurization and decompression were set at 600 and 1000 MPa/min, respectively. The initial temperature increase during pressure build-up (about 2-3 ºC/100 MPa) was taken into consideration in order to achieve the desired operating temperature during pressurization. Pressure and temperature were constantly monitored and recorded (at 1 s intervals) during the process using a SCADA based software (Stansted Fluid Power Ltd., Stansted, UK). The condiment pastes samples (50 gm) were processed at 200, 400 and 600 MPa pressures for a period of 5 min at 30 ºC. Flexible polyethylene bags filled with the sample (50 gm) were immersed in a water bath (Medica Instrument Mfg Co.) for isothermal pasteurization at 96-98 C for a residence time of 15 min. The pH of the samples was measured using a pH meter (Century, Model CP931, and Bangalore, India). Total phenolics were estimated by the method described by Singleton and Rosi . Ten grams of sample extract was diluted to 100 mL with water and 1 mL of Folin reagent was added to 5 mL of this aliquot. After 6 min, 10 mL of 7% Na2CO3 was added and the volume was made up to 25 mL with distilled water followed by incubation at room temperature for 90 min. The absorbance was read at 750 nm using distilled water as blank. 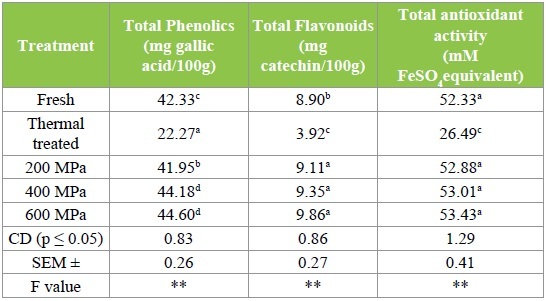 Total flavonoids were estimated using the method described by Zhishen et al. . 15g of sample extract was dissolved in water and volume was made up to 100 mL with distilled water. 5 mL of this aliquot was taken and 0.3 mL of NaNO2 (5%) was added, kept for 5 min followed by addition of 0.3 mL of AlCl3 (10%) again kept for 6 min followed by addition of 2 mL sodium hydroxide (1N). Volume was made up to 10 mL with distilled water and absorbance was read at 510 nm using distilled water as blank. The anti-oxidant activity of onion paste was estimated according to the procedure described by Benzie and Strain . FRAP reagent (900 μ L), prepared freshly and incubated at 37 ºC was mixed with 90 μ L of distilled water and 30 μ L of test sample or methanol (for the reagent blank). The test samples and reagent blank were incubated at 37 ºC for 30 min in a water bath. The final dilution of the test sample in the reaction mixture was 1/34. The FRAP reagent contained 2.5ml of 20 mmolL-1 TPTZ solution in 40 mmolL-1 HCl and 2.5 mL of 20 mmolL-1 FeCl3.6H2O and 25 mL of 0.3 molL-1 acetate buffer (pH 3.6). At the end of incubation, the absorbance readings were taken immediately at 593nm using a spectrophotometer (Shimadzu 1609, Tokyo, Japan). Methanolic solutions of known Fe (II) concentrations, ranging from 100 to 2000 μ molL-1, FeSO4.7H2O were used for the preparation of calibration curve. The parameter Equivalent Concentration (EC1) was defined as the concentration of antioxidant having a ferric-TPTZ reducing ability equivalent to that of 1mmol-L-1 FeSO4.7H2O. PPO and POD activities were measured as per the method described by Gonzalez et al. . For PPO activity, 2 gm of sample was homogenized at 0 ºC with 20 mL of 0.1 M sodium phosphate buffer (pH 7). Extract was filtered through muslin cloth and centrifuged at 0 ºC for 20 min at 3500 rpm. The supernatant was suitably diluted with a known volume of 0.02 M sodium phosphate buffer (pH 2). Four milliliters of 0.1 M phosphate buffer and 0.8 mL of catechol (0.055 g dissolved in 100 mL distilled water) were taken in four test tubes. One milliliter of distilled water was added in one test tube as sample blank, while in others, 1 mL of sample extract was added. The absorbance was measured after 1, 2, and 3 min at 410 nm. The samples (2 gm) were homogenized at 0 ºC with 20 mL of 0.1 M potassium phosphate buffer (pH 6.5) for measurement of POD activity. Extract was filtered through muslin cloth and centrifuged at 0 ºC and 4500 rpm for 20 min. The resultant filterate containing the enzyme (0.12 mL) was added with 3.48 mL substrate solution [0.1 mL guaicol (99.5%) + 0.1 mL hydrogen peroxide (30%)] and mixed well in a vortex. POD activity was measured from the rate of change in absorbance at 470 nm after 3 min. Surface colour of the samples was recorded using a colour meter (Mini Scan XE Plus, Model 45/0-S, Hunter Associates Laboratory, Inc., Reston, VA,) as reflected in CIE LAB (L*, a*, b*) colour space. All the measurements were referenced to the CIE (Commission Internationale de 1’Eclairage) using the standard illuminant D65 and 10˚ observer, and the equipment was calibrated using white and black standard ceramic tiles. Microbiological analyses of the samples were carried out for standard plate counts, yeast and mold counts and total coliform counts according to APHA  procedures. The samples (10 gm) were transferred into a sterile tube to which 15 ml of sterile peptone water (0.1%) was added. The sample and peptone solution were blended for 5 min in a homogeniser. Serial dilutions were made using sterile peptone water and then pour plated in different agar media, to visualise the growth of total plate count, coliforms and yeast and moulds. Colonies were counted after incubation and the results were expressed as cfu/gm of sample. Sensory analysis was carried out by using Quantitative Descriptive Analysis . A fifteen-member panel was screened and selected based on their sensory discriminative ability from a group of 30 members from scientific staff of the laboratory. Verbalization of the perceptions of product’s quality attributes was carried out by the selected panel. It was followed by scoring of the products on repeated trials to obtain a complete quantitative description. A score card consists of attributes in order of occurrence and as agreed by the panel. Samples were given 3-digit random code numbers and were presented to the panelists for evaluation. Panelists were asked to mark on a scale of 0-15cm to indicate the intensity of each attribute on the score card. The scale had vertical anchors at 2.5cm from each end, representing the ‘Detection threshold’ and ‘Saturation threshold’, respectively. The scores given for all the attributes for each sample was tabulated. The mean value was calculated for each attribute of a sample, representing the panel’s judgment about the sensory quality of the product and profiles were generated. All measurements were performed in triplicates for different physicochemical parameters and the data obtained from the physicochemical analyses, as well as sensory evaluation, were analyzed statistically by one-way ANOVA with least significant difference (LSD) at p<0.05, using Statistica 7 software (Stat Soft, Tulsa, OK, USA). The initial pH, moisture content, and water activity of the onion paste was found to be 5.47, 83.85 and 0.974 respectively. Polyphenoloxidase and Peroxidase are responsible for the negative flavor and color changes in vegetables. Inactivation of PPO is highly desirable due to brown discoloration and subsequent organoleptic changes caused by them. The application of thermal treatment and high pressure treatment at different pressure ranges affected the PPO and POD activities significantly (p<0.05) (Table 1). A total inactivation of PPO and POD enzymes was observed in the thermal treated onion paste. However, in the case of pressure treated samples, while lower pressure (200 MPa) activated the onion PPO, higher pressures 400-600 MPa decreased significantly (p<0.05) the onion PPO enzyme activity. The activation effects as a consequence of pressure treatments could be due to reversible configuration and/ or conformation changes of the enzyme and/or substrate molecules . Pressure-induced membrane damage and the resulting leakage of enzyme and substrate could have enhanced onion PPO activity at lower pressures. Apparent activation of PPO enzyme has also been reported by Bayindirli et al. . According to Mozhaev et al. most covalent bonds participating in the proteins are pressure insensitive and the hydration changes that accompany noncovalent interactions contribute largely for the pressure induced inactivation of the enzyme. However, the magnitude of pressure and the source of enzyme markedly affect the pressure stability of PPO. The effect of high pressure treatment on POD activity of onion samples was found to be more pronounced with respect to pressure treatment at 600 MPa (68%) followed by 400MPa (62%) and 200MPa (59%). Guerrero-Beltran et al. observed a similar decrease in PPO activity with increase in pressure in peach puree Ramaswamy and Riahi  also reported decrease in PPO activity in high pressure processed apple juice. Table 1: Effect of high pressure processing on the enzyme activity of onion paste. Values with different superscripts in the same column differ significantly (p ≤ 0.05). PPO : Polyphenoloxidase; POD : Peroxidase; ND: Not defined. Abs. Units : Absorbance units. Phenolics are a group of chemical compounds found in plants, characterized by the presence of more than one phenol unit or building block per molecule. The effect of processing on total phenolic content is given in Table 2. Significant differences (p<0.05) were recorded in the onion pastes with both pressure and thermal treatments. A marked decrease of 47% was observed in the phenolic content of thermal treated onion paste over the fresh control samples. This could probably be due to higher temperature sensitivity of phenolic compounds. Lower pressures (200 MPa) caused a slight decline (0.89%) in the phenolic level whereas higher pressure treatments in the range of 400-600 MPa caused a significant increase of 4.3 and 5.3% respectively. The activation of PPO enzymes at 200 MPa pressures that was observed in this sample can be related to the reduction in phenolic content. The increase in phenolic levels could be due to disruption of the vacuoles where these compounds are confined. Increases in the phenolic content of the sample as a result of high pressure treatment have been reported by several researchers. Roldan-Marin et al. 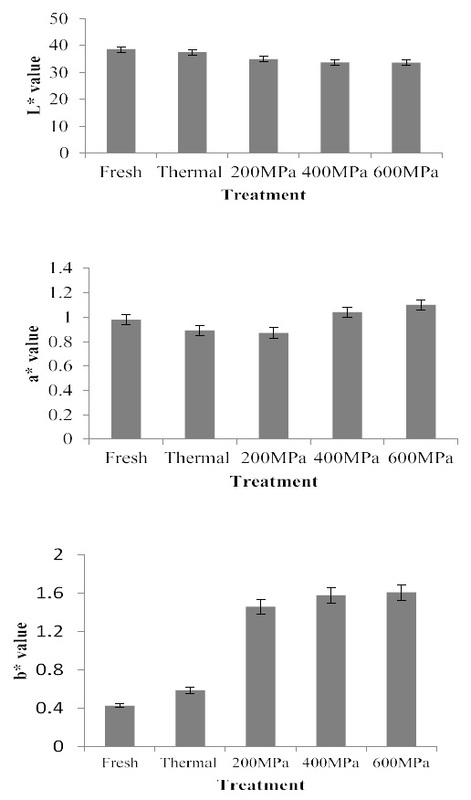 reported a 12% rise of total phenol content in onions when treatments 100 MPa and 400 MPa pressure combined with high (50 ºC) and low (5 ºC) temperatures respectively were applied. Corrales  has also reported an increase in total phenolic content in grape by products following high pressure treatment. Similar results have also been reported in the case of tomato puree treated at 600MPa by Patras et al. . Contradictory results were observed by Larrauri et al. who reported 18.6 and 32.6% decrease in total phenolic compounds in red grape pomace peel at a temperature of 100 and 140 ºC, respectively, which is attributed to the high temperatures used during processing. Significant reduction in phenolic content was also observed in fruit smoothies processed at 450 MPa for 5 min . Table 2: Effect of high pressure processing on total phenolics, flavonoids contents and antioxidant activity of onion paste. The flavonoids are known to be potent free radical scavengers and antioxidants and are considered to be protective against cardiovascular diseases and to contribute in the prevention of colorectal cancers in humans. The total flavonoid content in high pressure processed onion pastes showed an increasing trend whereas in thermally processed samples flavonoid content reduced significantly (p<0.05) (Table 2). Among the three pressure treatments 600 MPa showed a greater increase in flavonoid content (10%) than 400MPa (5.05%) and 200MPa (2.3%). Roldan-Marin et al. reported that 26% higher total quercetin, quercetin- 4’-glucoside and quercetin-3,4’-diglucoside contents in onions treated at 100 and 400 MPa pressures compared to untreated ones suggesting that high pressure might have triggered higher extractability of the flavonoid compounds. Flavonol content was also found to increase in high pressure processed orange juice which may be due to opening of chains and release of flavonol compounds at high pressures . In the present investigation, the total flavonoid content showed a slight increasing trend in onion pastes which might be due to higher extractability of flavonoid compounds on application of pressure. On the contrary, Chauhan et al. reported that application of high pressures, temperatures for longer time durations resulted in decrease in the total flavonoids content of the black grape juice. The pressure stability of antioxidants is of significance due to the important role they play in reducing the risk of degenerative diseases and oxidative damage associated with it. The data pertaining to total antioxidant activity has been presented in Table 2. For onion paste investigated in this study, high pressure treatment essentially preserved the antioxidant activity in comparison to thermally treated samples. These results are in accordance with the increase in phenolic and flavonoid compounds observed on high pressure processing. Statistical analysis revealed that there was a non-significant increase (p<0.05) observed in all the pressure treated samples over the fresh controls. At the same time, thermal treatment led to a 49% reduction in thermal treated onion paste. Increased anti-oxidant activity may be probably due to the high pressure induced changes to the tissue matrix, disruption of plant cell walls resulting in release of antioxidant compounds into the extracellular environment. The results of present study are in comparison with the observations of Moreno et al. who reported an increase in antioxidant activity in tomato puree at a pressure of 400 MPa suggesting that high pressure treatment affected the structure of the cellular matrix releasing various antioxigenic compounds from cellular structures such as vacuole, chromoplast etc. Fernandez-Garcia et al. reported better preservation of anti-oxidative principles in high pressure treated tomato puree. Patras et al. also reported better retention of antioxidant activity in high pressure treated strawberry and blackberry purees at 10-30 ºC for 15 min compared to thermal processed ones processed at 70 ºC for 2 min. Instrumental color parameters (L*, a* and b*) as affected by thermal and high pressure treatment is presented in Figure 1. It could be inferred from the data that both thermal and high pressure processing treatments were found to affect the instrumental colour parameters. The L* value, which indicate lightness of the product, was found to decrease significantly (p<0.05) with increase in pressure in the onion paste showing darkening of the products. Pressure induced browning due to activation of onion PPO may explain the decrease in L* value. The pressure treatments ranging from 200-600 MPa imparted an increase in the CIE a* values, which indicate redness/greenness. Similarly, b* values, which indicate yellowness/blueness of samples, were found to increase with increase in pressure from 200 to 600 MPa. Color changes were of same magnitude and no statistical difference could be observed between the different pressure treatments. High pressure processed samples had significantly higher a* values as compared to thermally treated samples (p<0.05). The increase in redness (a* value) with increase in pressure could be attributed to the increased extractability of anthocyanin pigments on pressure treatment. Increased L* value indicated darkening of the sample which may be related to the increased enzyme activity at higher pressures. Patras et al. reported an increased redness at pressure treatments as compared to unprocessed tomato puree. Higher redness at pressure treatments may be due to better extractability of anthocyanins due to disintegration of chromoplast. Anthocyanins are stable during high pressure treatment at moderate temperature, e.g., pelargonidin-3-glucoside and pelargonidin-3 rutinoside in red raspberry and strawberry during high pressure treatment at 800MPa at 18-22 ºC/15 min . Nguyen et al. also reported decrease in L* values and increase in a* values in carrot and radish, whereas, there were not much changes in the b* values. Effect of high pressure processing on CIE color values of onion paste. Error bars represent ± SD. Figure 1: Effect of high pressure processing on CIE color values of onion paste. Error bars represent ± SD. Application of high pressures and thermal treatment was equally effective causing a significant (p<0.05) reducing effect on microbial counts in terms of total plate count, total coliform count as well as yeast and mold count (Table 3). The total plate count reduced from 7x102 as in control to nil in the onion paste sample treated at 600 MPa. The total coliform counts also decreased from 1.5x101 to nil and the yeast and mold counts also decreased to nil at a pressure of 600 MPa in the condiment paste sample. Several reports exist with regards to pressure inactivation of microorganisms at high pressure showing pasteurization/sterilization effects in different types of products [31-33]. In the present study also similar results have been obtained. The microbial inactivation of the processed samples is mainly due to the pressure induced changes in the microbial cells, including inhibition of key enzymes, inhibition of protein synthesis, alterations in cell morphology and the cell membrane, as well as affecting the genetic mechanisms of the microorganism such as disruption of transcription and translation and cellular functions responsible for survival and reproduction [34,35]. Table 3: Effect of high pressure processing on microbial attributes of onion paste. Values with different superscripts in the same column differ significantly (p ≤ 0.05). ND : Not defined. Figure 2 represents the sensory profile of the high pressure processed onion paste. In the diagram, each spoke is one attribute and relative intensity is represented by that point at which the product line crosses with the lower intensity towards the center point and the maximum intensity the farthest from the center . Results indicated that marked differences exist between the thermal and pressure treated samples for the attributes: cooked flavor, pungency, pinkish colour etc. The high pressure treated onion paste appeared to be more acceptable than the thermally processed ones. It is mainly due to the fact that thermal treatment affects both covalent and non-covalent bonds, high pressure processing only disrupts relatively weak chemical bonds (H-bonds, hydrophobic bonds, ionic bonds) . Therefore, flavors and pigments that involve covalent interactions remain unaltered to a greater degree on high pressure processing. From the sensory profile data, it is clear that thermally treated paste had a cooked flavor and a reduced pungency. The color was also found to be less appealing to the sensory panel. Several studies are available which shows the sensory evaluation of high pressure processed foods using QDA and which advocates the lesser alteration of product sensory properties [38,39]. 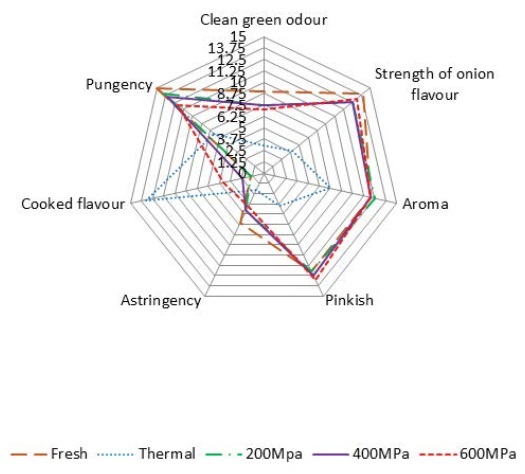 Sensory profile of high pressure processed onion paste. Figure 2: Sensory profile of high pressure processed onion paste. Results of the present study prove the potential of high pressure processing as a novel non-thermal method for the stabilization of onion paste. Application of high pressures was found to decrease the enzymatic, i.e. PPO and POD activities with better retention of phytochemicals such as phenolics, flavonoids and antioxidant activities. The tristimulus colour (L*, a*, b* values) and sensory acceptability of the condiment pastes were not much affected by the high pressures.